Cleveland Browns GM John Dorsey (left) and owner Jimmy Haslam talk before the game against the Green Bay Packers at FirstEnergy Stadium in Cleveland, Ohio on December 10, 2017. Reportedly, the Cleveland Browns’ coaching decision could come down to an in-house power struggle. CLEVELAND — What will be the deciding factor in the Cleveland Browns’ coaching search? That is the question being asked by fans and reporters alike as the search rolls on into its ninth day, but we may have a clue as to how this decision eventually will play out, and of course, internal discord is at the forefront. According to Mike Florio of ProFootballTalk.com, a league source says factions have formed within the organization as the “football people” (led by general manager John Dorsey) and “analytics guys” (under the direction of chief strategy officer Paul DePodesta) each have candidates at the top of their lists and the names do not match. 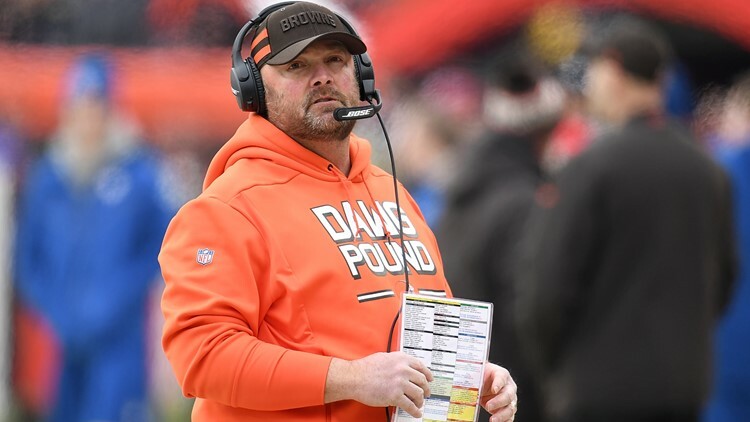 Currently, there are two finalists for the job, interim offensive coordinators Freddie Kitchens (Browns) and Kevin Stefanski (Minnesota Vikings). 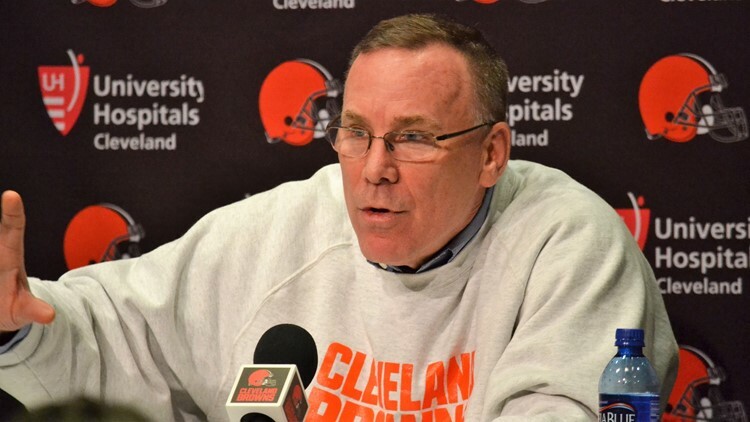 Cleveland Browns GM John Dorsey remains committed to keeping his options open in the coaching search despite Gregg Williams' success in the second half of the 2018 season. Kitchens was the Browns’ final interview in the first round, while Stefanski was the third candidate brought in during the process. Stefanski was called back to Berea Tuesday for a second round of questioning with the search committee. “For now, the thinking is that Dorsey (and Mayfield) prefer Kitchens, and that DePodesta prefers Stefanski to Kitchens,” Florio wrote. “However it plays out, this may not end up being the kind of inspired hire that Mayfield’s presence could have sparked. Prior to the dismissals of coach Hue Jackson and offensive coordinator Todd Haley on October 29, the Browns averaged 21.125 points per game and were outscored by more than five points per outing. Once Kitchens took over the play-calling duties, the Browns showed improvement in points per game scored. The Browns averaged 23.75 points per game, up more than 2.5 per outing. Under Kitchens’ direction, rookie quarterback Baker Mayfield completed 180 of his 263 attempts (68.4 percent) for 2,254 yards and 19 touchdowns against eight interceptions. Mayfield averaged 281.75 yards and 2.375 touchdowns per game with Kitchens calling the plays. 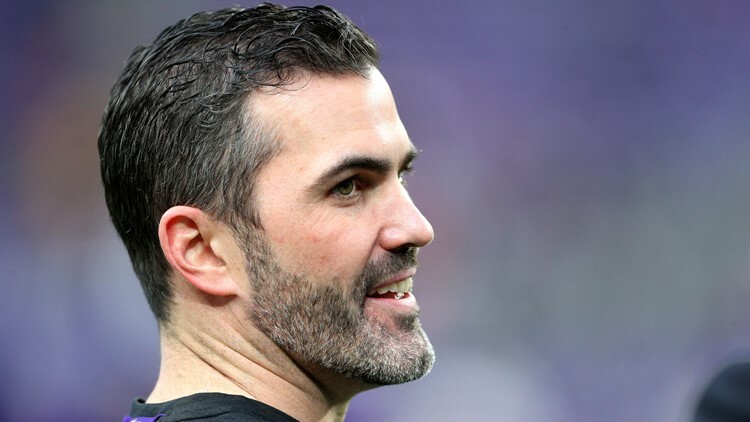 Minnesota Vikings interim offensive coordinator Kevin Stefanski surveys the field before a game against the Chicago Bears at U.S. Bank Stadium in Minneapolis, Minnesota on December 30, 2018. With Stefanski on staff, the Vikings won 10 or more games five times, including the second-best finish in franchise history. The 2017 Vikings posted a 13-3 record, which ranks second only to the 15-1 mark set by the 1998 team.